A panel on the left of the map lists the latest, strongest, and the most reported tremors for the selected time scale. 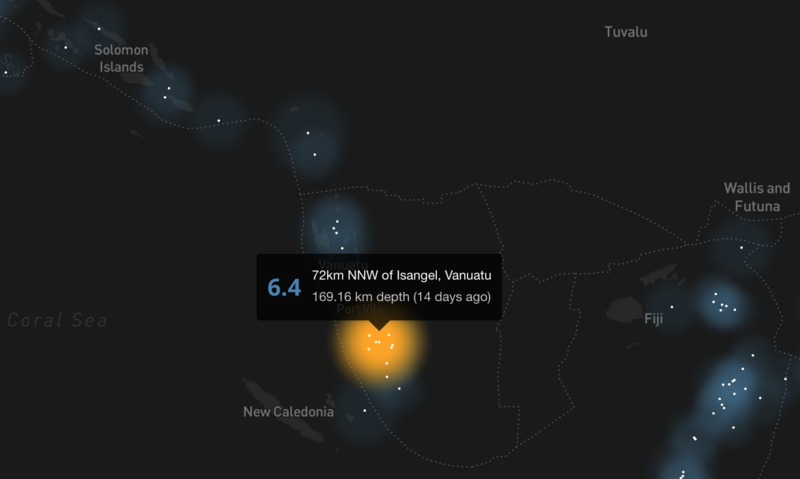 In the past month, for example, the strongest earthquake was located northeast of Australia, close to the Republic of Vanuatu, with a magnitude of 6.4 on the Richter scale. On the other hand, the earthquake that was most strongly felt and therefore the most reported by people on the ground was a dense cluster of tremors around Ontario, California. This quake had a magnitude of 3.6 and was reported 1320 times. When you hover over any recorded tremor, the map shows the magnitude in blue and the attributes – including the magnitude on the Richter scale, relative location, depth of the tremor, and the recorded day. The Richter magnitude scale, developed by Charles F. Richter in his 1935 paper, measures the strength of earthquakes. It is determined from the logarithm of the amplitude of waves recorded by seismographs. While an average of 500 tremors is recorded every day around the world, it is likely that the larger the tremor, the less frequently it will occur. One of the most well-known earthquakes – the 2011 Tohoku earthquake – was recorded at a magnitude of 9.1. The subsequent tsunami killed more than eighteen thousand people and triggered the meltdown at the Fukushima power plant in Japan which resulted in an estimated 220 billion dollars of damage. But what caused such a devastating earthquake? 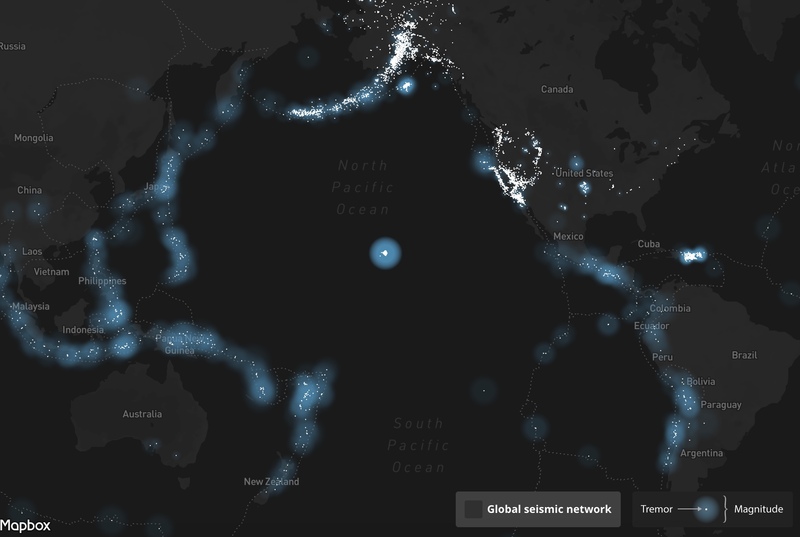 The first thing to know is that the epicenter of the earthquake was located along the “Ring of Fire,” a major area in the basin of the Pacific Ocean where many earthquakes and volcanic eruptions occur. According to USGS, about 90% of the world’s earthquakes and 81% of the world’s largest earthquakes occur along the ring; some of the world’s largest volcanic eruptions have also occurred along the ring. This effect is a direct result of plate tectonics – the movement and collision of lithospheric plates, especially subduction in the northern portion. Although we don’t know when the next big earthquake will occur, we can be well-prepared beforehand. Applications such as “early earthquake warning system” and ShakeAlert provide residents with an earthquake warning a few seconds to around 30 seconds before the shaking begins- depending on the magnitude and the distance from the epicenter – so that they have time to react. The designer also provides the open source code for anyone to build their own earthquake tracker map, and to share it publicly. This map is a great representation of how today’s technology utilizes geography to assist scientific research and natural hazard relief. « Map of the Week: Debt in the U.S.